Adult body weight:male 20-40 g Fancy mice may be much larger - some of my males were up to 90g, and were not fat. Adult body weight: female 25-40 g My fancy mice average 50g for males and females. Life span 1.5 - 3 yr A broad range - few pet mice reach 3 years. Blood pressure 113-147/81-106 mm Hg Glad to say I haven't had to take a mouse's blood pressure! Crusty or discharging, runny eyes are often caused by conjunctivitis, or by some respiratory-related infections. Wounds to the eye itself can include puncture wounds, where the eyeball has been damaged by sharp objects, or even a piece of hay. In either event, veterinary attention is needed; antibiotic eye ointment is often highly effective. If you suspect a wound to the eye, seek help as soon as possible, as early treatment can save the mouse's eye. Cataracts are sometimes seen in older mice - the front of the eye becomes dull and cloudy. Sometimes hereditary cataracts are seen in mice of only a few weeks old. There is no practical treatment. Blindness or poor eyesight is not such a problem for mice as for humans, because their eyesight is relatively poor at the best of times. They can easily adapt to use their other, superior senses more. For blind mice, try to keep the cage furniture (nestbox, toys etc) in the same places, so that the mouse can find its way around easily. Unless you are 100% certain that the mouse has a tumour, ask your vet to check. Sometimes abscesses are mistaken for tumours, and prompt treatment could be important. Mice are prone to mammary tumours, which occur most commonly in the armpit, along the sides and on the abdomen, and sometimes on the back of the neck. Mammary tissue can be found in places you might not expect! See below for a photo of a mouse with a mammary tumour. Tumours start as a small lump and grow into larger lumps, some lumpy and some smooth. Generally the tumours that feel like smooth balls of fat under the surface, and which are not tightly attached to the underlying tissue, are the least serious and are easiest to remove. True tumours will not go away on their own, and there is at present no real 'cure' except surgery, although you can do other things to improve the quality of life. Your vet may be able to operate to remove a tumour, but bear in mind that a secondary tumour often grows within a few months of surgery. If you decide not to operate, mice can live very happily even with large tumours for some months. If the tumour starts to ulcerate it will become sore and raw on its surface; at this stage, either removal or euthanization is necessary. Steroid treatment can make the mouse's last few months more comfortable - one mouse owner's description of the effects of Prednisolone follows. 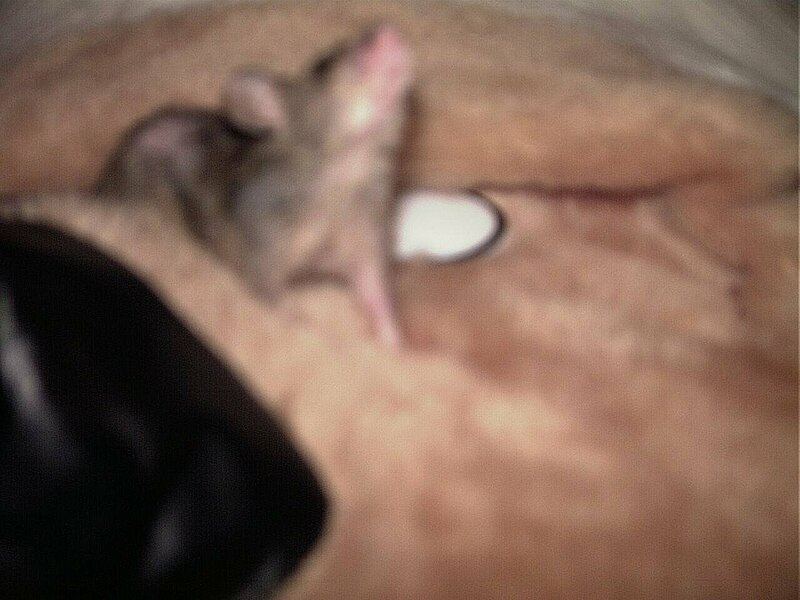 Here is a photo of Kiki, a Siamese Satin fancy mouse. She had a typical mammary tumour, just behind her left arm. The first tumour was removed, but sadly several more developed very quickly and she was euthanized six weeks later. (The depth of field is poor in the photo, so you cannot see her face properly). My mouse is sneezing and/or wheezing; what should I do? Respiratory illness in mice has two main causes. Either it is similar to asthma, and is caused by allergies or reactions to bedding etc., or it is caused by a contagious virus or bacteria. The former case is often not serious, but unfortunately the latter is. A common cause of chronic respiratory illness in mice and rats is an organism called Mycoplasma pulmonis. More to come about this at a future date. If the mouse is suffering from an asthma-type allergy, then normally only one in a cage will be affected, and it will not seem ill apart from its sneezing. Try a different bedding, and avoid sawdust, shavings or hay. Shredded paper or CareFresh, or a similar safe bedding, is the best option. In the case of contagious diseases, often the mouse will show other symptoms besides sneezing - for example, it may be hunched up, its eyes may be dull, its fur rough. Mice can succumb very quickly to life-threatening diseases, so prompt action is necessary. First of all, you need to work out whether the illness has been caught recently, or whether it is something that the mouse has succumbed to after carrying it for a long time. If the mouse has recently come into contact with new mice, at a show, or after new mice were introduced to the cage, then the illness could be highly contagious. Separate the affected mice from the healthy ones. Animals can carry infections for up to a month after symptoms have disappeared, so do not let any mice which have come into contact with the ill mice mix with mice from another cage for that period. If the mouse/mice which developed symptoms had not cone into contact with any strange mice in the last few weeks, then they may well have been carrying the disease for some time. Many organisms are opportunistic and can only cause illness when the immune system is not functioning at its normal level. Mycoplasma pulmonis can be an example of this - affected animals often live with others who carry the organism, but do not become ill. If this is the case, you should not separate the affected mouse from its companions - putting a sick mouse into solitary confinement will often accelerate its decline. If the companions have already been exposed to the same organisms as the sick mouse, leave them all together. If they're going to catch the bug, they will catch it whether you separate them or not. This is often caused by the mouse eating more green food than it is accustomed to. Common culprits are things like lettuce, cabbage and broccoli. Nerves can also cause diarrhoea in the short term, but this should only occur when the mouse is being handled/upset. On other occasions it will be caused by bacteria (ie food poisoning) or other infection, eg coccidiosis. If your mice are affected, keep them warm and make sure plenty of fresh water is available. Take your vet's advice on perhaps adding a rehydration solution to the water. Cut all greenstuff out of the diet for the moment. Many mouse breeders swear by Arrowroot as a traditional remedy for diarrhoea; you can feed the mice arrowroot biscuits (sold for humans) or arrowroot powder mixed in water. Arrowroot is a cooking ingredient that you should be able to find at your supermarket or grocery store. Ask the staff for help- it's used for thickening sauces. Try a pharmacy if the store doesn't have it. If cutting out greenstuff and feeding arrowroot does not produce results within a day or so, and the mice appear unwell, then contact your veterinary surgeon as treatment will be needed. Probiotics can help to cure diarrhoea, whatever the cause. These are friendly bacteria which live in the gut and help good digestion. The best ones are found in powder form and added to the water, eg Entrodex - ask your vet if they sell a similar product. A less good but easy to find alternative is live natural yoghurt - offer the mouse a small bowl. It is important to encourage the mouse to drink, and to keep her hydrated - ask the pharmacist for some rehydration solution for humans, eg Dioralyte, or add a tiny bit of sugar and salt to the water. This could be caused by a parasitical infestation or skin infection, or a food allergy. 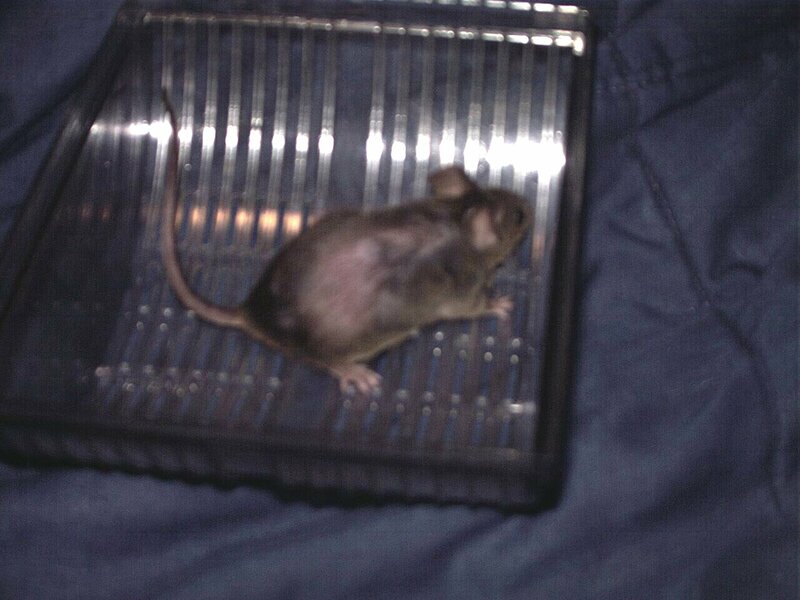 It is very difficult to diagnose parasitic infestation or skin infection - just looking at the mouse is not enough. Your vet should inspect the mouse, and will probably need to look at skin scrapings under a microscope. Parasites on animals this small are often not visible to the naked eye. A common mouse parasite is the fur mite, often referred to just as 'mites', although there are other mites which can affect mice, including the mange mite. Sarcoptic Mange is usually species-specific, although some types can be transmitted between different animals, and many varieties can live on humans in the short term. Mouse mange often causes intense itching on the ears, and the mouse may scratch these to shreds if it is not treated promptly. If you see scabs on a mouse's ears or tail which are not obviously due to fighting or accidents, watch carefully; at the first sign of continued scratching, get the mouse to a vet and ask the vet to check for mange. The family of mange mites is known as Sarcoptes scabiei (sarcoptic mange mite, itch mite), and specific strains or varieties infest specific animals. This means that mange from a dog is unlikely to cause a serious problems in mice, although varieties will sometimed live on other species in the short term. Larvae live in pockets within the skin, and adult males live on the surface of the skin. The larvae in the skin cause intense itching, causing the animal to rub and scratch itself. Sarcoptic mange is often difficult to diagnose from skin scrapings; skin biopsies are more accurate. Scrapings should be taken from 8-10 sites. Can be treated with Ivermectin. Other mouse skin problems you might see include ringworm, which is a fungal infection causing bald patches, and lice, which may be visible as small moving specks. Again, a vet should see the mouse to confirm a diagnosis. If there is no sign of parasites, or if treatment for parasites does not work, then suspect a food intolerance. There is a lot of folklore about parasites on mice, and how they should be treated. Whilst practical advice from experienced mouse keepers is invaluable, it is not a substitute for veterinary examination and advice. The best approach is to use theory and experience together, so try discussing with your vet what other mouse keepers have told you. Are my mice grooming, scratching, playing or fighting? Mice groom themselves with their teeth and claws. The usual grooming routine may involve a mouse scratching itself with the hind feet, then perhaps washing its face or fur with its hands (spreading saliva on the hands, and rubbing them over the fur), and grooming with the teeth. This looks like the mouse is nibbling at its fur. Excessive grooming sometimes occurs when rodents are nervous. A mouse may wash its face continually if it feels insecure. Whilst this looks cute, continuous, vigorous face washing is a sign that the mouse should be left undisturbed for a while. 'Barbering' occurs when a mouse nibbles away patches of fur - from its own body, or that of another mouse. You may notice short patches of fur, but no irritation to the skin. It is a habit, like nail-biting in humans, which tends to get worse when the animal is nervous. Concentrate on keeping the affected mice happy (eg see section on 'environmental enrichment' in 2b), but do not worry about this habit. It is only a nuisance if you wish to breed or show mice. The habit is often hereditary, so 'barbers' should not be bred from. Mice groom each other with their teeth. Grooming can sometimes be a way of expressing dominance (working out who is boss), or friendship. You may see one mouse holding another with its hands, whilst appearing to nibble at its fur. This is nothing to worry about, even if the mouse which is being groomed squeaks and doesn't appear to like it. Playing: no squeaks, or very quiet ones. Mice may play 'catch' and chase each other, but no wounds, and no signs of stress or ill health, will be seen. Young mice tend to be more playful than older ones - it is rare for mice younger than 3 months or so to truly fight. When mice fight seriously enough for it to be a problem, you will usually hear loud squeaking and see blood or scratches on the skin when you stroke the fur against the direction of growth. Note that loud squeaking often occurs when mice scrap or argue, without serious fights occurring. Fighting looks quite different from grooming behaviour - the mice will usually run around, perhaps one or both jumping towards the other with tail twitching angrily, or fur fluffed up. One or both mice may run off to get 'time out' and may look fed up. One mouse may seem to chase the other constantly. Fighting is most common when the cage has just been cleaned, as mice re-establish their individual territories and dominance within it. Female mice tend to fight for a few days after a newcomer is introduced, as each mouse has to re-establish her place in the hierarchy. Male mice often fight in attempts to move up the hierarchy. It is common to hear regular banter coming from a cage of male mice. Give the community as much space as possible - at least 24"x12" for between two and six male mice - and lots of small hiding places so that each mouse can have his own territory. Fighting is something of a hobby for male mice - you do not need to separate them unless one has a bleeding wound or appears stressed. If the level of fighting is unacceptable, your first move should be to look for a larger home for the mice. Small wire cages can be extended by attaching other cages, for example. Please think carefully before separating the community. You may be condemning one of your mice to a life of solitary confinement. Splitting the mice up for 'time out' is not a good idea - it will probably be much harder to reintroduce them, than it would have been to leave them all together. If you have several male mice, and fighting or bullying is making one miserable, try removing the most aggressive mouse - the bully - and leaving the victim in with the others. If you just remove the victim of bullying, the bully may find someone else to pick on. This is Linda, she has a bad habit of pulling out her fur.